Origin The area of origin of Babco is in the Andes of Southern Colombia and Ecuador (Azuay, Chimborazo, Canar, Pichinch, Loja and Tungurahua). 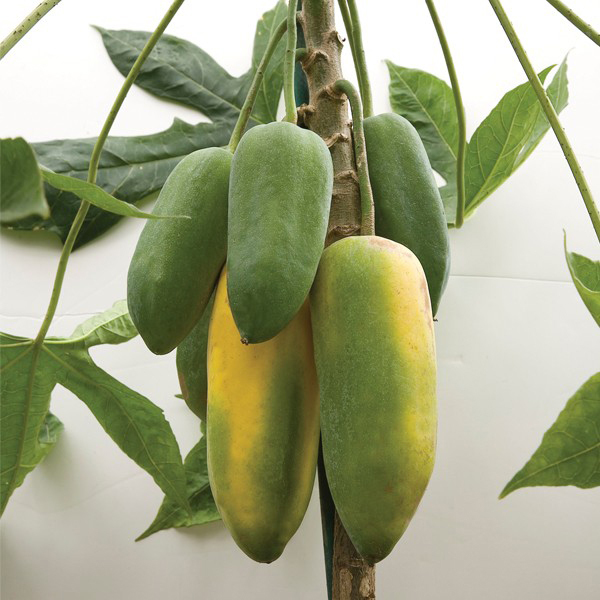 Babaco is a relative of papaya but is seedless having smooth skin as well as unique flavor. When the fruit is sliced, it forms star shaped. The fruit could be added to smoothies, sauces and salsa. Babaco is native to Andes of northwestern South America from Colombia south to central Chile. Besides its native range, it is successfully cultivated in New Zealand, California, Guernsey, Channel Islands and Italy. 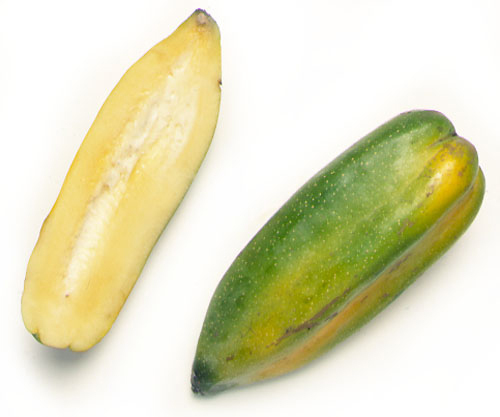 Common names of Babaco are Babáco, Champagne Fruit, Heilbron and Mountain paw paw. 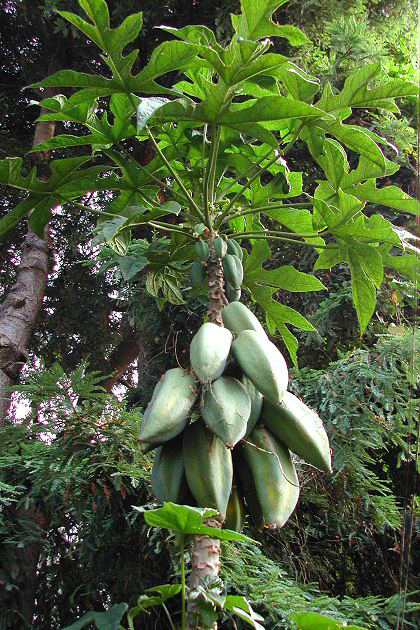 Babaco is a small herbaceous shrub which resembles the appearance of other papaya species. 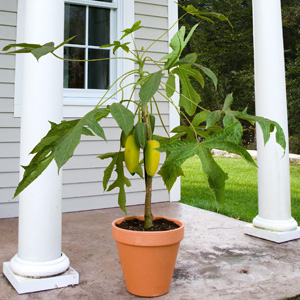 The plant grows up to the height of 3 meters. The plant has large, dark green leaves which are deeply lobed and prominently ribbed or veined. Flowers are bell shaped having dark green sepals and creamy to white petals and are borne in leaf axils. All flowers are female. Flowers are replaced by elongated fruit which measures 30 cm (1 ft) long and weighs 2 kg each. When young fruits are green which turns to orange or yellow when ripened. Fruits do not produce seeds. 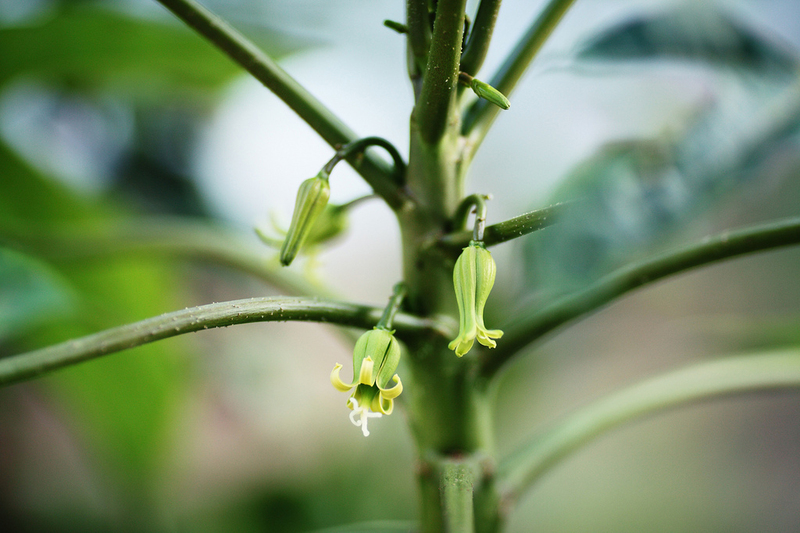 The plant produces female flowers only and could produce from 30 to 60 fruits in a year. 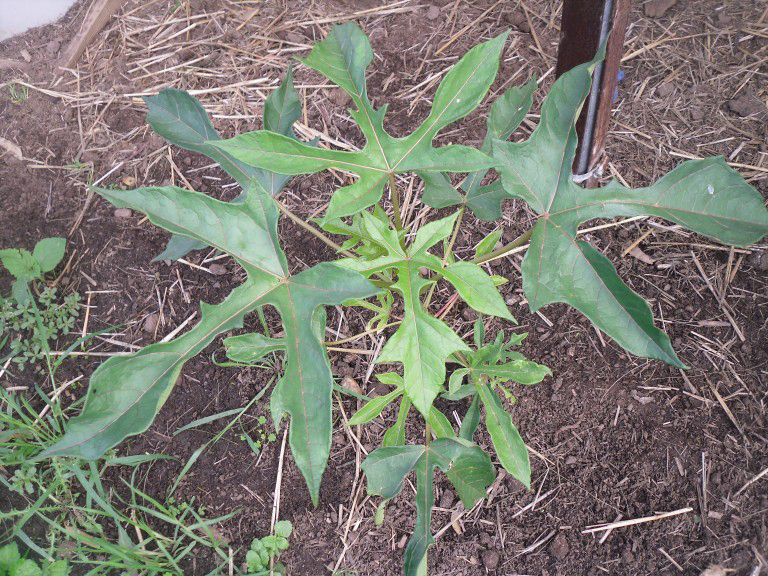 The plant is propagated by rooting axillary shoots. Babaco prefers cool subtropical climate. Extreme low temperatures produce the mature fruit with rough and pitted skin. 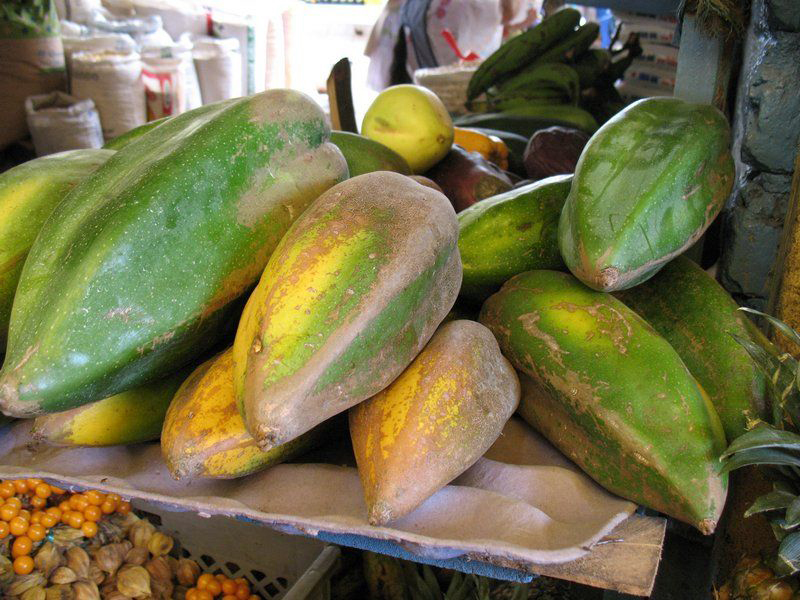 This fruit contains three times more papain than papaya. Babaco is a great source of vitamin A and Vitamin C. Vitamin C promotes healthy gums and also speeds up healing process. It contains riboflavin, thiamine, magnesium, potassium, calcium, ascorbic acid, fat, niacin, riboflavin, sodium, protein, carbohydrate and iron. Papain is a digestive enzyme which assists to break protein bonds. 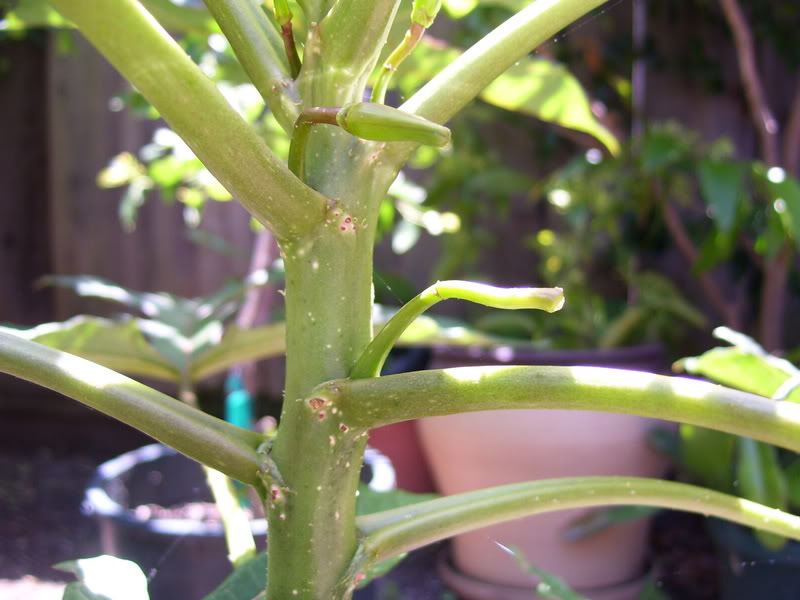 It is a small herbaceous shrub which measures 1.5 to 3 meters high with erect softwood and semi-lignous trunk associated with leaf scars such as papaya. It has shallow root system having flashy tuberous roots of 40 cm diameter and various lateral roots. Leaves are large, alternate, coriaceous, 40 cm across and palmate having 5 to 7 lobes. All flowers are female and solitary. Flowers measures 3.5 cm across and are campanulate with dark green sepals and yellow petals. Fruit is an aspermous berry in pentagonal shape with no seeds and ovarian cavity. It has five longitudinal ridges. Fruit turns from yellow to golden yellow when ripened and measures about 20 to 30 cm long and 12 to 18 cm wide. Flesh is thick, juicy and whitish to cream colored with juicy, acid to sweet taste. Taste of Babaco resembles the blend of strawberries, pineapples and bananas. Add Babaco to the diet or enjoy in the form of smoothie or juice. In has three times more papain in comparison to papaya. It is also a great source of vitamin C and A. The body requires Vitamin C which assists in healing process of wounds and maintains healthy gums. It possesses ascorbic acid, riboflavin, thiamine, water, niacin, protein, sodium, calcium, potassium, magnesium, iron, fat and carbohydrate. This fruit also contains meaningful amounts of digestive enzyme, papain which break down bonds in protein naturally. The potassium content in Babaco is a vital component of cell as well as body fluids and also controls heart rate and blood pressure by countering the sodium effects. The content of Vitamin C, A and E helps to maintain healthy eyesight, supports digestion and maintains healthy skin. Babaco is proven as a natural solution for weight loss. Babaco is solution of weight loss because 100 grams of this fruit offers 20 calories. One could enjoy this fruit without worrying about putting on weight. Babaco has high content of fiber which promotes digestion, reduces hunger pangs and increase satiety levels. Fiber gives the feeling of fullness which results in eating less. It is helpful for obese people. It also prevents unhealthy eating habits which results in unnecessary weight in the body. The adequate amount of nutrients and better digestion assist in loosing excess weight from the body. 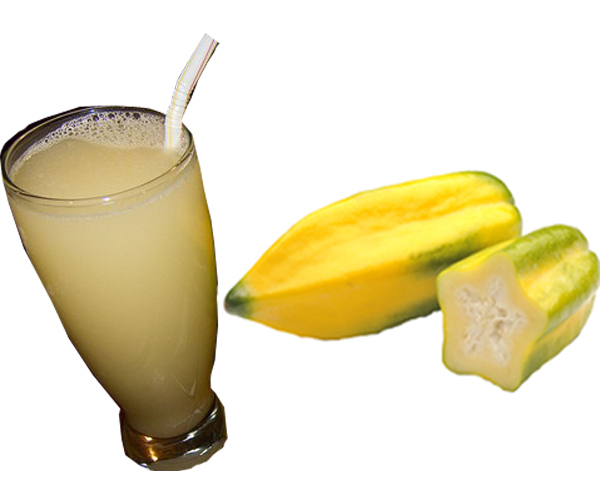 Babaco has papain which is beneficial for digestive enzymes. Consume this fruit to promote smooth digestion and prevent the chances of various digestive problems. It stimulate digestion ability in a greater extent. Babaco fruit has low amounts of sugar and is less sweet. It provides natural aount of sugar that keeps the levels of sugar under control. Babaco has low content of sugar which proves to be beneficial for regulating the level of blood sugar. It could be consumed by diabetic patients because it won’t increase blood glucose substantially. Potassium is a vital mineral that the body needs to carry out the functions of the body and cognitive function smoothly. Babaco is a great source of potassium which allows sufficient oxygen to reach brain and promote cognitive functions significantly. Babaco effectively treats skin disorders as well as infections. It is a cure for skin inflammations, eczema, reddening of skin, skin burn and other skin infections. 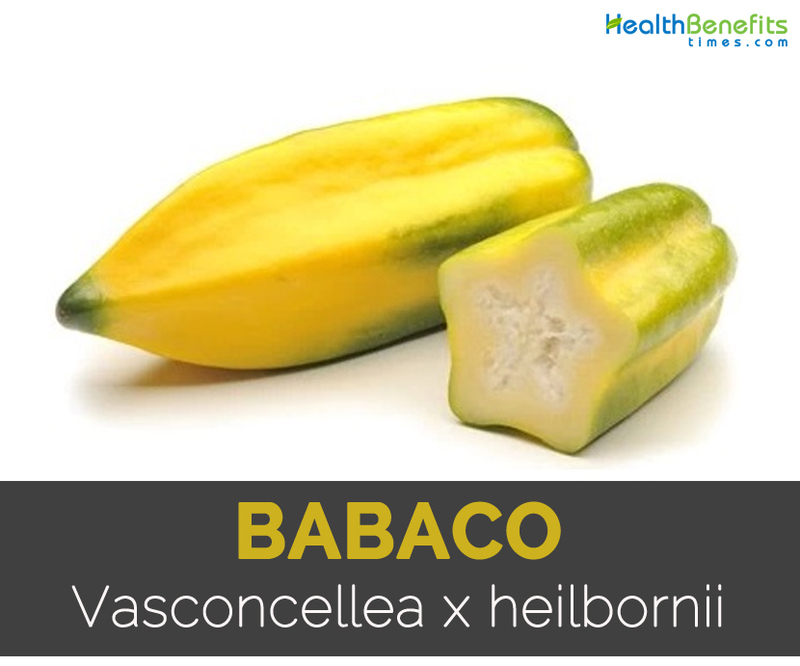 Babaco is an abundant source of Vitamin C which assists in healing process of wounds. To maintain the youthful appearance, add babaco to the diet which prevents the damage caused by free radicals. Vitamin C promotes collagen synthesis that allows you soft and elastic skin. It prevents signs of premature aging in skin and provides natural youthful appearance. Blood pressure is a major reason for health problems such as diabetes, heart disease, anxiety, thyroid etc. This fruit contains potassium and other nutrients which supports body to maintain overall health by regulating the levels of blood pressure in the body. Consume this fruit for preventing the chances of various health ailments caused due to blood pressure. Babaco helps to balance blood pressure levels in a person and normalizes it. Babaco is also a great source of dietary fiber which is an essential nutrient for maintaining regular bowel movements. Consume this fruit to eliminate constipation. The diet high in fiber content helps to reduce the chances of getting colorectal cancer. It is a known fact that fruits in bright colors are loaded with beta carotene which acts as an antioxidant. Babaco is an excellent source of beta carotene which is essential for maintaining eye health and promotes vision substantially. Beta carotene shield retina which is a layer of light sensitive cells found at the back of eye balls. This fruit has high content of Vitamin A which supports eye health and eye sight. Addition of this fruit to the diet assists in maintaining good eye health. This fruit helps to prevent eye sight problems such as night blindness, myopia, glaucoma and cataracts. The content of Vitamin C promotes the capacity of the body for absorbing iron from the foods that we eat. The presences of adequate levels of iron in the body promote good count of red blood cells and promote hemoglobin. Consume babaco in order to prevent the chances of anemia and its adverse effects on health. Babaco is loaded with sufficient nutrients which are essential for the body to smoothly function the body processes. The nutrient content found in this fruit counteract harmful infections and ailments and also promotes immunity. Vitamin C acts as a powerful antioxidant and is essential to maintain strong immune system. The babaco is believed to be originated from the Central South Highlands of Ecuador. It was cultivated before the arrival of Europeans in Ecuador. Then the babaco was introduced to New Zealand. Then it was commercially grown in Israel and Middle Eastern parts. The Babaco was introduced to the Southern California by Steve Spangler in 1970’s. Wash the babacos, slice into rings or lengths, remove the seeds and cut it into pieces. Put the babacos, together with the mint leaves, green chillies, cumin seeds, mustard seeds and salt, into a mortar, and pound with the pestle (or use a silbatta) into a pulp. Add water as needed to thin the chutney to the desired consistency. Wash the babacoes, peel it off and cut it into pieces. Put all the ingredients in a large vessel and let boil on medium heat for 30 minutes, stir occasionally. Remove the cinnamon stick and let cool. Refrigerate the unused portions for upto five days. This syrup can be served as a delicious topping for ice cream, or plain as a simple, or a refreshing dessert after a large meal. Apply the latex to cure warts. Babaco is used by Incas for treating obesity and stress problems. It is used to enhance immunity. Consume it with other fruits to prevent allergies and infecitons. It also helps to prevent constipation. 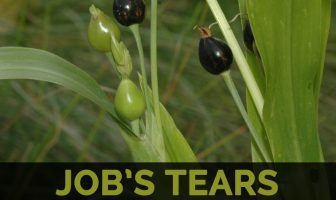 Babaco contains papain which might cause burns and mild irritation. People who are known to allergy should not use it. Consume the pulp fresh, processed into juice, stewed, dehydrated fruit powder, concentrate, dried preserves, marmalade, candies and syrup. It could be used in the form of jams, sauces, pickles and pie fillings. Add it to cheese cakes and yogurt. Use the fruit in smoothie, fruit salad or chilled fruit cocktail. It could be used in fruit pies. Prepare a drink by mixing it with some sugar or honey in a blender. The plant has an average life span of eight years. Native The area of origin of Babco is in the Andes of Southern Colombia and Ecuador (Azuay, Chimborazo, Canar, Pichinch, Loja and Tungurahua). It is also cultivated in Australia, New Zealand, Italy, Israel, California and Guernsey.